Ricky Ponting believes the first Test between Australia and India proves umpires are not monitoring for front-foot no-balls. The issue came into focus on day four in Adelaide after Aaron Finch was given out to Ishant Sharma, only for a review to show the India quick had overstepped. 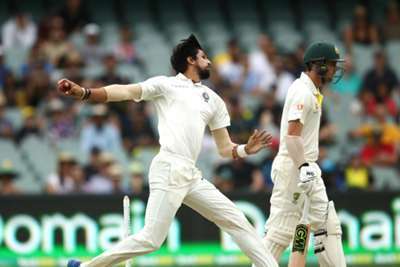 Former Australia captain Ponting felt a number of Ishant's other deliveries should have been deemed no-balls but were not signalled. Finch only made 11 before falling to Ravichandran Ashwin and Australia were 104-4 and trailing by 219 runs at stumps. "I've said this for a lot of years; I honestly don't think the umpires look at the front line anymore," Ponting told cricket.com.au. "Some of the ones we've seen … he was 4-6 inches over the line. "I don't think the umpires are looking and I certainly don't think they were looking at those ones because they were blatantly obvious ones. "And as we know now, they'll only ever look at them if a wicket falls, which as far as I'm concerned is not right. "Part of umpiring is to get the no-ball decisions right as well. I'm not asking for everything to be spot on, but if you're six inches over then surely you can call it. "If I was the fielding team, I'd want to know. If I was Virat Kohli and I knew that my bowler was bowling a no-ball more often than not, I'd want to know that so I could pull that back in line."